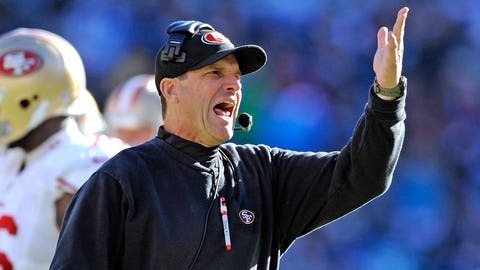 Will Jim Harbaugh be looking for tips from Oregon coach Mark Helfrich? Oregon has played two games in Levi’s Stadium this season. The San Francisco 49ers, not counting the preseason, have played six. Guess which offense has been more potent? If you chose Jim Harbaugh’s attack, think again. The Ducks offense has scored 103 offensive points in two games in Santa Clara, going for 51 Friday in the Pac-12 Championship Game throttling of Arizona. The 49ers, meanwhile, boast a total of 98 points. For Oregon, that would be an average of 55 points per game. For the 49ers, it’s 16.3. Ducks quarterback Marcus Mariota by himself accounted for 10 scores at the stadium, seven passing and three rushing. The Ducks’ other victory in Levi’s Stadium was a 59-41 whipping of Cal in October, a game which also included a punt return for a touchdown to bring their total number of points scored in Santa Clara to 110. The Niners’ most recent home game was an ugly 19-3 loss to the defending Super Bowl champion Seattle Seahawks. If you want to count San Francisco’s two preseason home games, it only brings them up to 119 points. They were shut out in the stadium opener Aug. 17 against the Broncos, then beat the Chargers 21-7 a week later.